Samuel Phillip Eason was born in Yeovil Marsh in 1886, the son of agricultural labourer George Eason of Mudford Sock and his wife Jane. In the 1891 census George and Jane were living at Mudford Sock with their family that included seven-year-old Kate Riggs (George's illegitimate daughter) as well as George and Jane's children Samuel aged six, Anna aged four, Walter aged one and Edwin just a few weeks old. By the time of the 1901 census George Eason had died and Jane had moved into Yeovil with her family. The census recorded them living at 41 South Street; Jane, a widow aged 39 was working as a charwoman and Samuel, now aged 16, was working as a blacksmith. Also living with them were Walter and Edwin as well as a new daughter, seven-year-old Florence. In April 1909, at the age of 24, Samuel married Rosina Sams (1885-1968) in Yeovil. They were to have one daughter, Violet (1910-1988) and another child who died in infancy. Samuel and Rosina set up home at Stoford, just south of Yeovil and in the 1911 census Samuel listed his occupation as a railway labourer. It is not known when Samuel enlisted in the Army by he joined the Regular 1st Battalion, Somerset Light Infantry at Yeovil probably shortly after the start of the First World War. At the outbreak of war in 1914 the 1st Battalion was in Colchester, with 11th Brigade, 4th Division. The Battalion landed at Le Havre, France with the British Expeditionary Force (BEF) on 22 August 1914, in time to fight in the battle of Le Cateau during the retreat from Mons. In 1914 the 1st Battalion saw action at the Battle of the Marne, the Battle of the Aisne and at the Battle of Messines. The First Battle of the Marne, fought from 5 to 12 September 1914, resulted in an Allied victory against the German Army. The battle was the culmination of the German advance into France and pursuit of the Allied armies which followed the Battle of the Frontiers in August, which had reached the outskirts of Paris. The counterattack of six French field armies and the British Expeditionary Force (BEF) along the Marne River forced the German Imperial Army to abandon its push on Paris and retreat north-east, leading to the 'Race to the Sea' and setting the stage for four years of trench warfare on the Western Front. The Battle of the Marne was an immense strategic victory for the Allies, wrecking Germany's bid for a swift victory over France and forcing it into a drawn-out two-front war. The Battle of Messines, fought between 12 October and 2 November 1914, was part of the 'Race to the Sea', the series of battles that decided the line of the Western Front. In the aftermath of the first Battle of the Marne, it was decided to move the BEF back north to Flanders, to shorten its supply lines back to the channel ports. The Battle of Messines was the official name for the fighting between the river Douve and the Comines-Ypres canal, but it merged into the battle of Armentières to the south and the first battle of Ypres to the north. After the heavy fighting of 1 November the Somersets were relocated to a new position. The Regimental History of the Somerset Light Infantry outlined events of 2 November 1914 - "The new position held by the Somersets was no sinecure. It faced east, north-east and north, and was therefore, in fact, open to enfilade fire. This became apparent during the 2nd November, when both H and A Companies' trenches were heavily shelled by hostile heavy guns, one of the former and two of the latter companies' trenches being enfiladed from the east.... Although the Battalion Diary records that "Both this Battalion and the Hants suffered very heavily" no other details of casualties are given." Nevertheless it was in this position occupied by the Battalion that Private Samuel Eason was killed in action that day. He was aged 28. Samuel Eason is commemorated on Panel 3, Ploegsteert Memorial, Hainaut, Belgium. 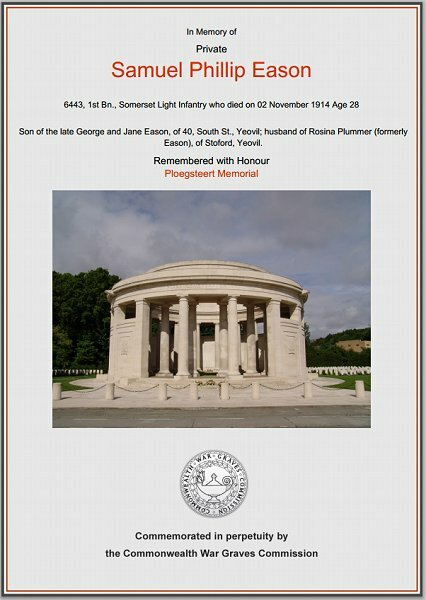 A note on the Yeovil Town website reads "Samuel Eason had one daughter but as Samuel was reported missing presumed killed, his mother would never accept his death and refused to have his name inscribed on the Yeovil War Memorial. However, in September 1989, Mrs Evans, of Bridport called at the offices of South Somerset District Council to enquire whether Samuel’s name could be added to the Memorial because her mother, Samuel’s daughter, would dearly like to see her father’s sacrifice commemorated in his native town. This was agreed and his name has been added. Samuel’s widow was living in Stoford at the time of her husband’s death and his name has been included on the Barwick and Stoford Memorial in Barwick Church." 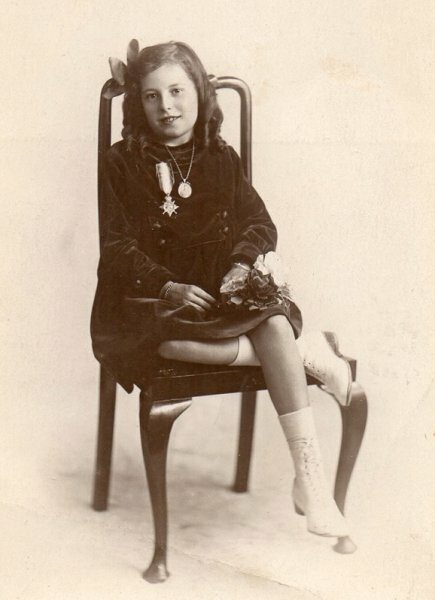 Samuel's daughter Violet, about 1920, wearing her late father's medal (either a 1914 Star or a 1914-15 Star) as well as a necklace pendant with his photograph. The Commonwealth War Graves Commission certificate in memory of Samuel Eason.